Located about 35 miles from New York City, the Rockaway River is a local favorite. It wasn’t always though. It has taken a lot of efforts by many groups to bring the river back to life. The river now has great hatches that provide an abundant supply of fish over its 30-mile stretch. Be sure to check out the hatch chart below. Because of how close it is to the big cities Fly fishing NJ brings fly fisherman from New York, Maryland and Pennsylvania to its waters. 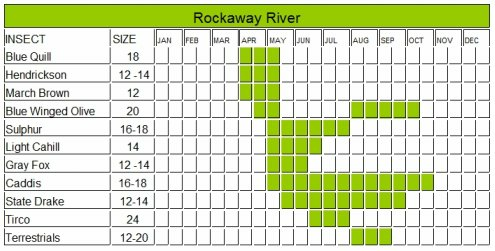 There is no problem getting to the river, as there are many places to access the Rockaway. You can access this fine river from Route numbers 699,15 and 46, as they all have some great access points. The upper portion around Wharton and Dover has nice pools, pockets and runs and very good fishing. The middle section around Boonton and Denville has some bigger pools that hold larger fish, and is a very good stretch of river. 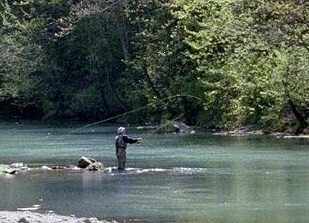 The best section is considered to be from Wharton to Dover as the numbers of trout in this section are good and they will take a fly. The river eventually flows into the Jersey City Reservoir. The fishing below the reservoir does not hold many trout, mainly due to the water temperature is too warm. Trout need to have cooler moving water if they want to call it home. There are typical hatches of Mayflies, Caddis and Stoneflies but you should also have luck with small midges. Early season provides the best fishing of the season. You will usually have some success throughout the year using nymphs and streamers. With all the restoration the river has received the Rockaway is a great choice for the avid fly-fisherman. Leave the Rockaway River and return to the New Jersey page.